This fun and creative Chicago architecture walking tour puts architecture in context of the arts and pop culture. What does Michael Jackson’s Thriller have to do with the design of a post-modern skyscraper? Or Andy Warhol’s soup cans with modernism? The Best Architecture Walking Tour Since Sliced Bread is a creative tour of Chicago architecture, designed for curious people. You will learn about architectural styles through their connections with technology and culture, including pop culture. We’ll look at lots of eye candy while expanding our understanding of architectural styles and Chicago history, right in the heart of downtown Chicago. We start at the Michigan Avenue Bridge where the city began and end at the new Maggie Daley Park. All arts are a reflection of an age. Styles in creations like architecture, graphic design, fashion design and pop culture have similar qualities when they come from the same era. We will compare architecture with contemporaneous works other media to help us learn how to identify architectural styles and most all all, to understand their deeper connections with history. We will also consider how the advancements in technology and engineering have shaped buildings. This is a very visual and interactive tour. Why is this the “best” architecture walking tour since sliced bread? The fun and creative educational approach of this Chicago architecture walking tour makes it unlike any other architecture tour in the city. We know it’s absurd to call anything the “best.” We say this simply because the tour is the best for Detours-minded folks. The tour appeals to both Chicago locals and visitors. People well-versed in art history will enjoy it, as well as tour guests new to looking at art and architecture. You will learn about various architectural styles, both by looking at buildings in front of us and at images and video on shared iPads. 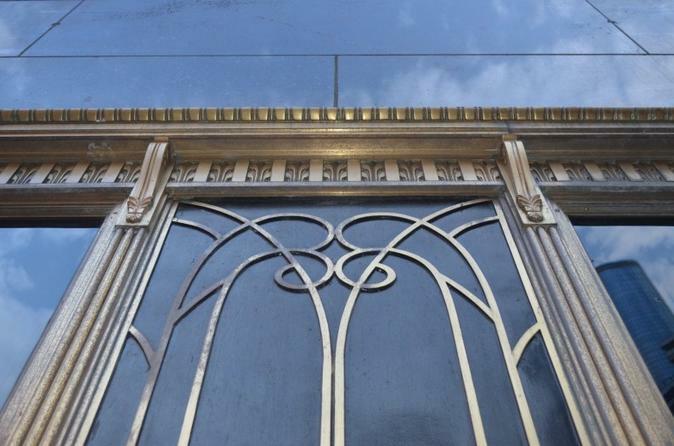 This architecture walking tour goes along Michigan Avenue south of the bridge. This is a bustling route where many people walk but rarely look up. With a secret short-cut through a Pedway passage, we conclude at the very new urban playground of Maggie Daley Park. Special Offer - Book by July 31 and save 10% compared to the local supplier's prices! - Book Now!